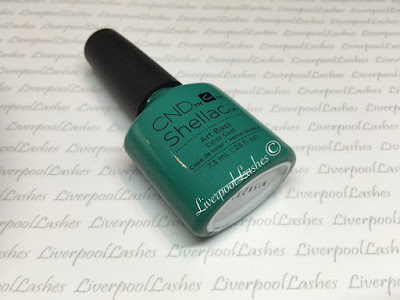 I know green shades may not be as popular as pinks and reds but the new CND Shellac colour in "Art Basil" is really a game changer. It's the perfect shade of green with shimmer that reminds me a little of the discontinued Moonlight & Roses. When I do these posts I literally grab a load of supplies and experiment, it's a lot of fun. I was going to layer Art Basil over Digi-Teal but the moment I applied the layer of Art Basil I fell in love with the blue/green tone in, it's gorgeous and a slight alternative to Art Basil on its own so I gave up on the carving idea. It's really a combination you need to try! Art Basil with Lecente Irridescent Glitter in Pink Champagne. Art Basil with CND Shellac in Grapefruit Sparkle. 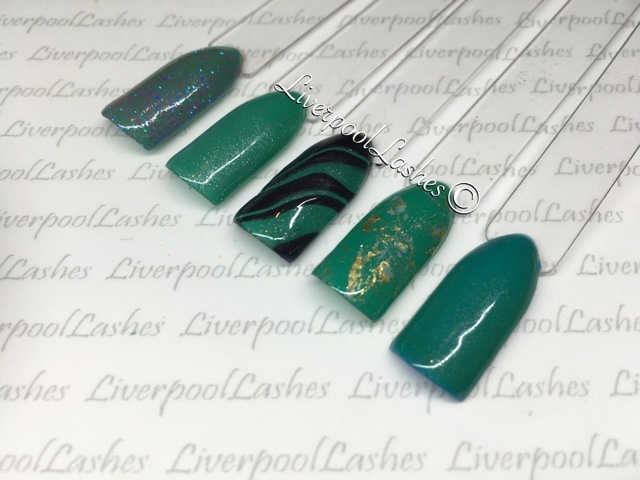 Art Basil with CND Shellac in Overtly Onyx over. I used the Lecente G1 brush and a dotting tool to then carve out the design. 'African Jade' foil bought online.